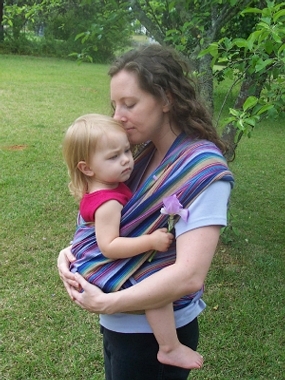 When I first heard that Motrin was bashing babywearing, I thought the momsphere was overreacting. And since I apparently don’t have some component installed on my computer that would let me view the commercial online, I put it out of mind. Then. Then, I read the transcript for motrin’s “I mean, in theory, it’s a great idea” commercial. Are you serious? Insensitive on so many levels. Don’t companies realize that it is never a good idea to question parenting choices? Nothing makes women angrier than someone (especially a corporation) questioning their choices. Motrin actually has a computer animated mom saying that even though babywearing hurts, it makes her “look like an official mom.” Good grief. For the record, lugging the heavy carseat carrier = backache. Using a simple piece of woven cloth to support my baby in my arms = sanity. Psst…want to see more pictures of mamas and papas sporting comfortable carriers? Check out our local babywearing group’s gallery. ETA: Thanks to a massive backlash, motrin has removed the ad. It will still run in ads that have already been printed. If you want to see the fuss and missed the motrin.com link, find it here on youtube. Posted in Babywearing, Blech, Products and Gear and tagged Babywearing, motrin. Bookmark the permalink. I see that the Motrin link is down. I double-checked against a couple of other blogs and it is the correct link. Hmmmm…are they rethinking? Luckily, I have Dr. Cara and Cassandra to keep my back pain in check. Who needs motrin when you can have chiropractic adjustments and acupuncture? Talk about FASHIONABLE!